My mind’s been in the gutter lately. How else do you explain the conversation I had the other day with acclaimed author and inveterate collector Mike Bruner. As the keyboardist for Rare Earth (remember “Get Ready” and “I Just Want To Celebrate”?) and an authority on porcelain signs, glass insulators, and petroliana collectibles, to name but a few of his areas of expertise, Bruner is a true Renaissance man, as comfortable talking about history and technology as aesthetics and the arts. So naturally, when we were speaking recently, I spent the whole time asking him about toilets. Actually, not the toilets themselves, but the floats that bobbed in the tanks behind them. Turns out, Bruner knows a fair amount about these curious footnotes to home-plumbing history. We’re not talking about your standard copper or plastic floats here, the ones you can still buy at Home Depot or Lowe’s. No, we’re talking about the glass toilet floats that were hand blown from the late 1800s until some time after World War I. Top: A C.D. Argent float. 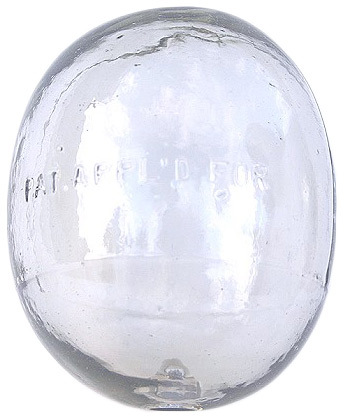 Above: This float show evidence of being hand blown and is possibly from the late 1800s. 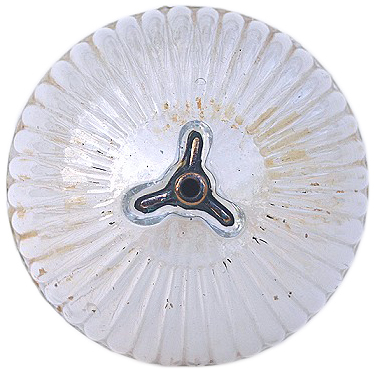 Like bottles from the same period, glass toilet floats can be dated by their pontil scars (or lack of) and mold marks, as well as the embossed legends on them, ascribing their production or distribution to long-since defunct businesses. 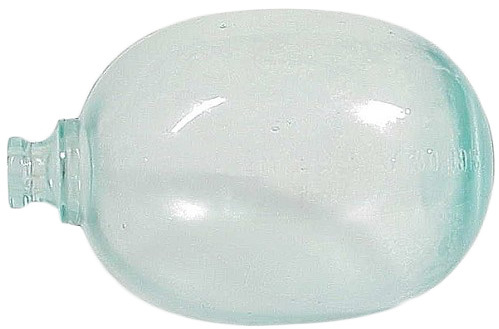 Floats were rarely produced in colors other than clear, which makes this aqua one rare. “They are kind of an obscure collectible,” says Bruner, who is apparently also a master of the understatement. “There are not a whole lot of these things around.” In fact, toilet floats are such oddball outliers in the collectibles world, there aren’t even established prices for them, although you can expect to pay anywhere from $15 to $200 for a good one. Which means, alas, that you won’t become suddenly rich if you check your old toilet’s tank and find a glass float back there. Don’t quit that day job just yet. A Heap & Sons float dated 1907. Other floats are easier to date. 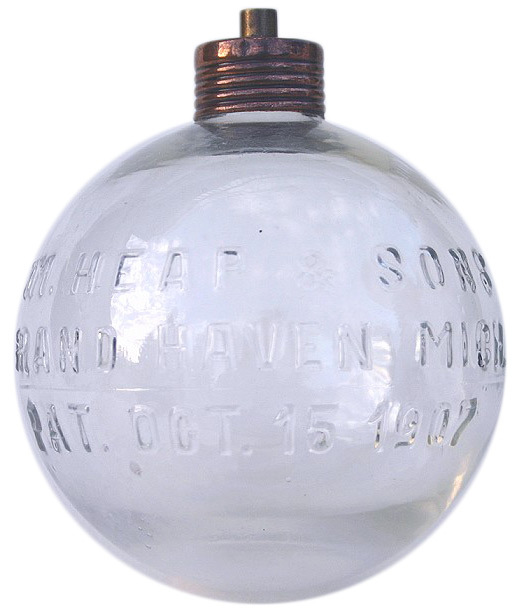 “I have one from William Heap & Sons of Grand Haven, Michigan, with a 1907 patent date on it, and an O.H. Jones of Hartford, Connecticut, from 1902. Glassmaking was quite common at the turn of the century,” Bruner adds. “Manufacturers made bottles, kitchen items, and utilitarian pieces used by industry.” A toilet float was just another product that could be cheaply and efficiently produced in glass rather than metal. Floats were often blown into molds. Molded pieces like this one are often described as pleated. Though he doesn’t have the evidence to prove it, Bruner thinks he knows who might have made some of his toilet floats. “One company that comes to mind is Rodefer Brothers, which was in the Ohio River Valley area.” Many glass houses, from Fenton to Fostoria to Anchor Hocking, were established there in the late 1800s and early 1900s. “It wouldn’t surprise me a bit if some of these floats came from that region,” Bruner says. This Jones float from 1902 may have been used for industrial purposes rather than in a toilet tank. 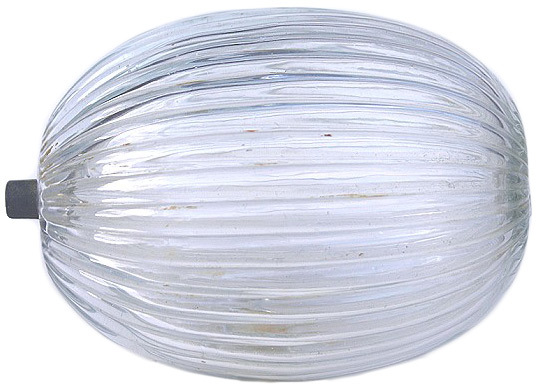 After much searching, I determined that this rather odd and old-looking glass bulb that I found on an farmstead (1839) in Ashtabula County, Ohio, is a toilet tank float. Says PYREX / T.M.REg.U.S.PAT.OFF. / MADE IN USA / 12. Am no expert, but appears it may have been blown into a mold. Has a seam on each side but a wavy line in the glass on the inside. Can you tell me anything about this item, or refer my inquiry to Mr. Bruner? I am particulary interested in the history and time period of the float, as well as roughly what it might be worth. I live in Australian and have recently discovered that the object I thought was a bottle is actually a glass toilet float. I have had this float for around 30 plus years. It has the Eisler’s Patent embossed on it and is made of clear glass measuring 6 ins high by 4.5 ins deep and in pretty good condition. There appears to have been a stopper in the top which might have been broken off flush with the top of the float but as this “break”is very even it might have originally been like that. Any information would be greatly appreciated. I’ve had a glass float at least 50 years at my home . It’s pleated I think ? is their a value to these things? As per your question about PYREX, I offer this. As one who grew up in Corning NY, and whose father was employed by Corning Inc. as a senior product designer, and whose mother was a librarian at CMOG, I know a bit more about glass than your average geek. I have a brown glass eislers ball float with the wire still around the head.Curious to know it’s value. Any info appreciated. I’m in Australia. 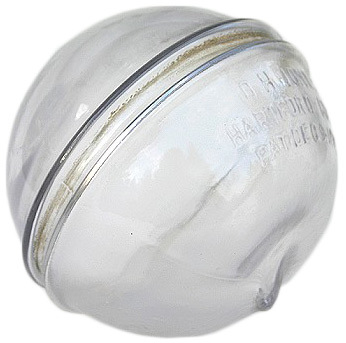 Ceramic bedpan with lid . Made by S.Maw.Son & Thompson at Aldersgate Street,London. I Would like to know its age & if it would be a collectors item. Loved Rare Earth, they’re on my phone! Who would have thought thought that? Something to start checking out in old home estate sales. You know slip into the bathroom look in the tank, ha ha. Who knows! Very interesting! I have an old but in excellent condition, Slipper Bed Pan, it does not contain the word ‘new’ in the writing in the pan so I think it must be the a first version. I would like to know its age and if it is a collectors item? Hoping you could tell us what the monetary value of the Heap and Sons glass float is worth that is dated 1907 on your website. Thank you in advance. Google “glass floats (fishing) nets.” There’s millions that have “escaped” from their slavery of supporting fishing nets and often wash up on beaches. I think they are still used. More resistant to damage from sunshine than metal or plastic, and more damage resistant. They weigh more as the glass is thick. Tough as rocks, come in a large variety of sizes and shapes. (Some more than 300mm/12 inches in diameter which makes you think “explosive mine” at first sight because there were a few WWII era mines showing up too, they would break away from the rusted chains holding them to the seabed. In the same area (in the seas around Hong Kong in the early 60’s) I also saw a few escaped explosive mines . They would shoot the explosive ones with rifles until they exploded. “ ” We are forcing Mattel to create an identity for Barbie.